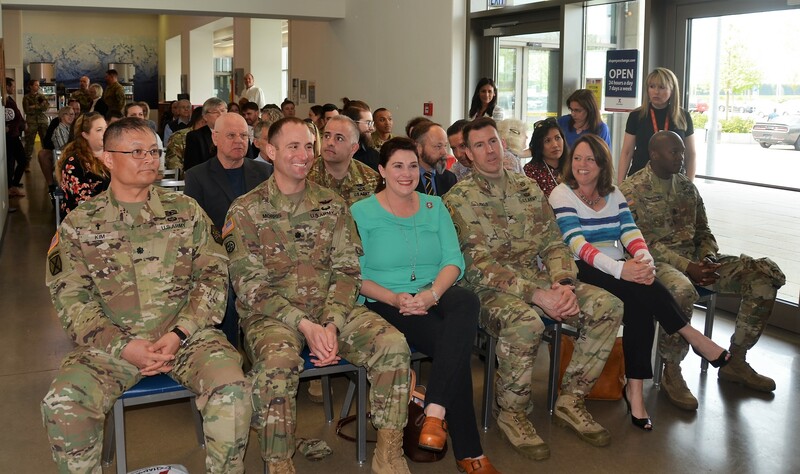 Photos and story by Bianca Sowders, USAG Ansbach Public Affairs. 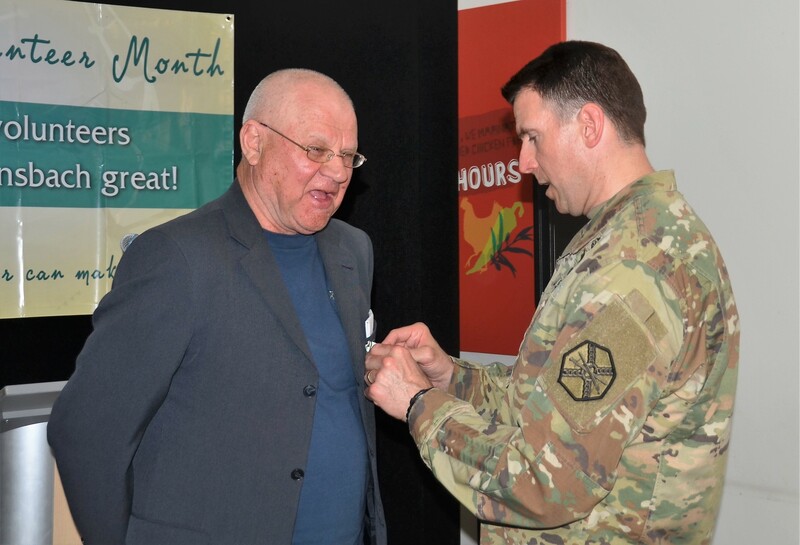 ANSBACH, Germany – Volunteers are a vital resource in any community, but especially a small U.S. Army garrison in Germany relies on helping hands for many of its activities. Kids sports activities or scouting groups, concerts and shows, theater productions, veteran and retiree organizations, American Red Cross, German-American clubs, family readiness groups, and so many more programs and activities would not be feasible without volunteers. Volunteering brings people together and builds community partnerships. It plays a key role in connecting people to one another, creating healthier families and healthier communities. 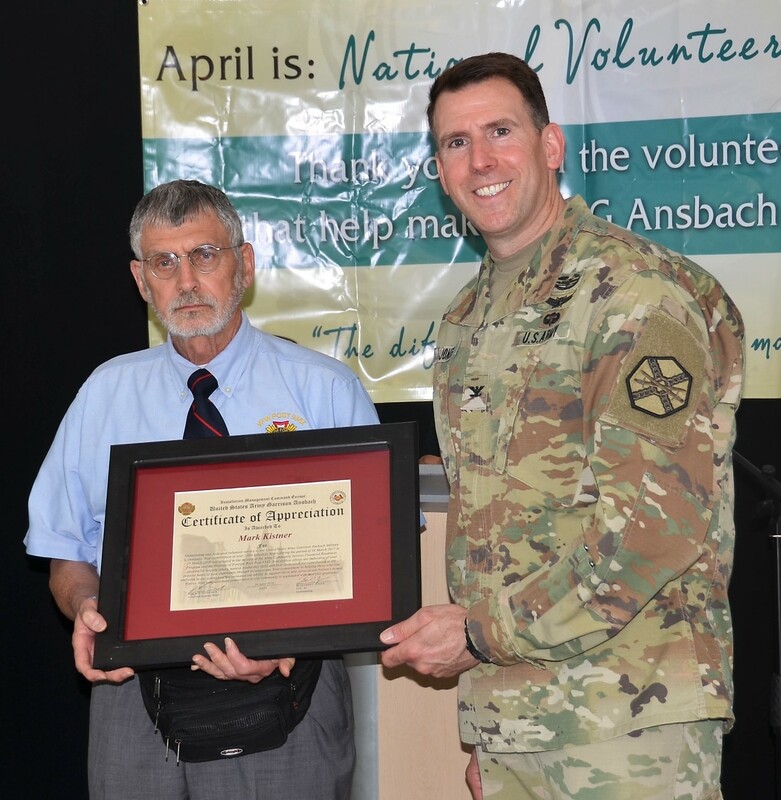 This past year 133 volunteers in U.S. Army Garrison Ansbach donated over 20,000 hours to the community. Using the value of one volunteer hour as calculated by the National Points of Light Foundation, that effort has a value of approximately $482,800. Hans Koppen-Jäschke, a German national, has been volunteering for chapels in Fürth, Bamberg and Katterbach since the 1990’s. During the past year alone he contributed 1,500 hours to Katterbach chapel, working as an usher and conducting bible study groups. 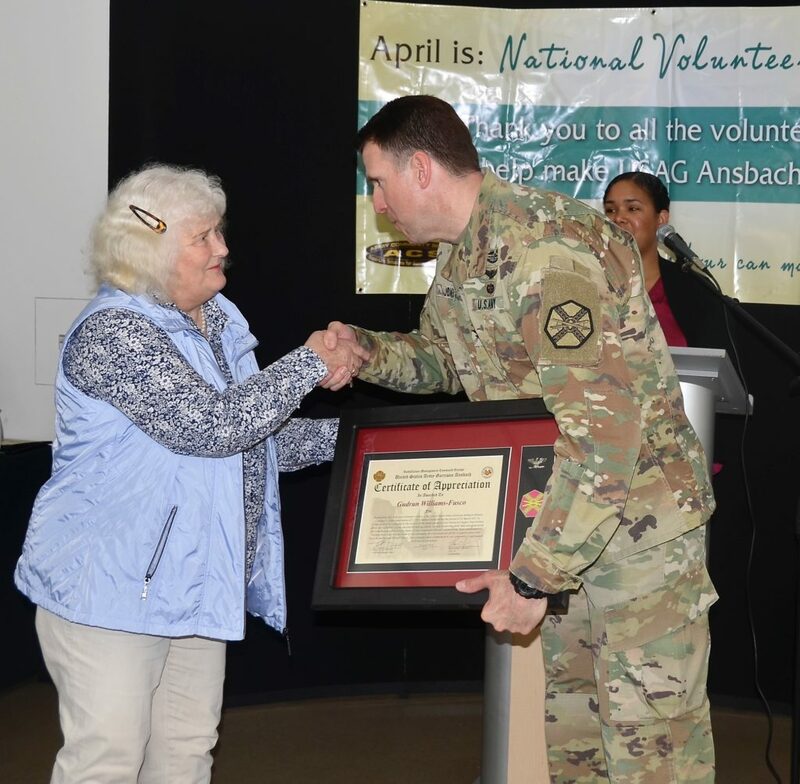 The volunteers of USAG Ansbach came from 18 different organizations, and include active duty members, retirees (both active duty and civilian employees), local nationals, and family members. 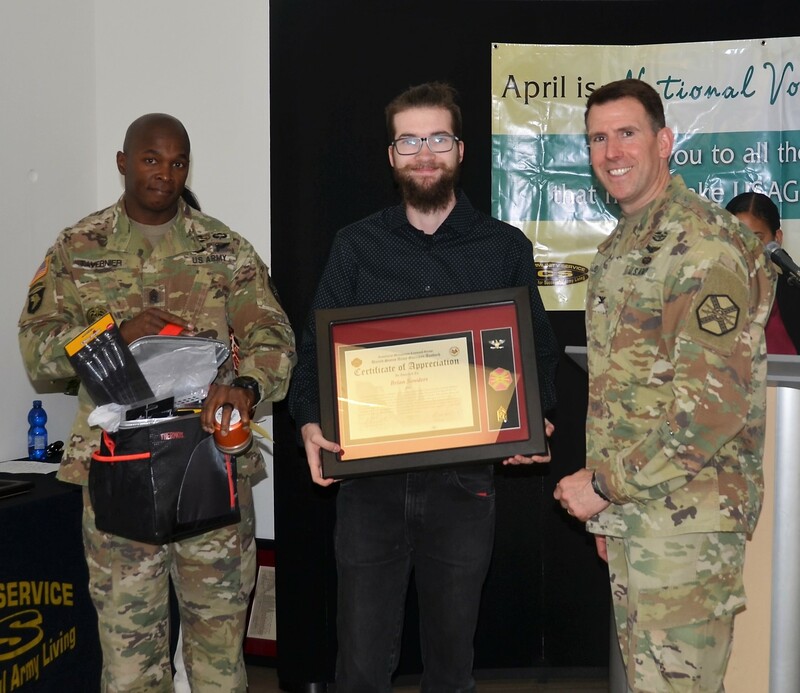 Mark Kistner contributed 1,000 hours to various organizations, including Service Financial Readiness Program and the Veterans of Foreign Wars Post 9342. Gudrun Williams-Fusco helped the Ansbach Chapter of the American Red Cross with 1,200 hours throughout the year. Margaret “Margi” Ritscher contributed 1278 hours to the Terrace Playhouse Theater, assisting with all productions behind the scenes and on stage. Brian Sowders worked more than 1,400 hours for the entertainment department, which included assistance in concert and show productions, as well as all theater productions at the Terrace Playhouse Theater, behind the scenes and on stage. Hans Koppen-Jäschke, a German national, has been volunteering for chapels in Fürth, Bamberg and Katterbach since the 1990’s. During the past year alone he contributed 1,500 hours to Katterbach Chapel, working as an usher and conducting bible study groups. He received a Commander’s Award of Public Service, which included a medal and a certificate, for his many years of volunteer service. The organization with the most hours contributed to within the last year was the Terrace Playhouse Theater with more than 7,000 volunteer hours. “There wouldn’t be a theater without our volunteers…there is so much more than the performing, there is helping out in the front of the house, building sets, fixing costumes, working lights and sounds … The volunteers are the life blood of the theater,” said Victoria Hanrahan, entertainment director of USAG Ansbach. 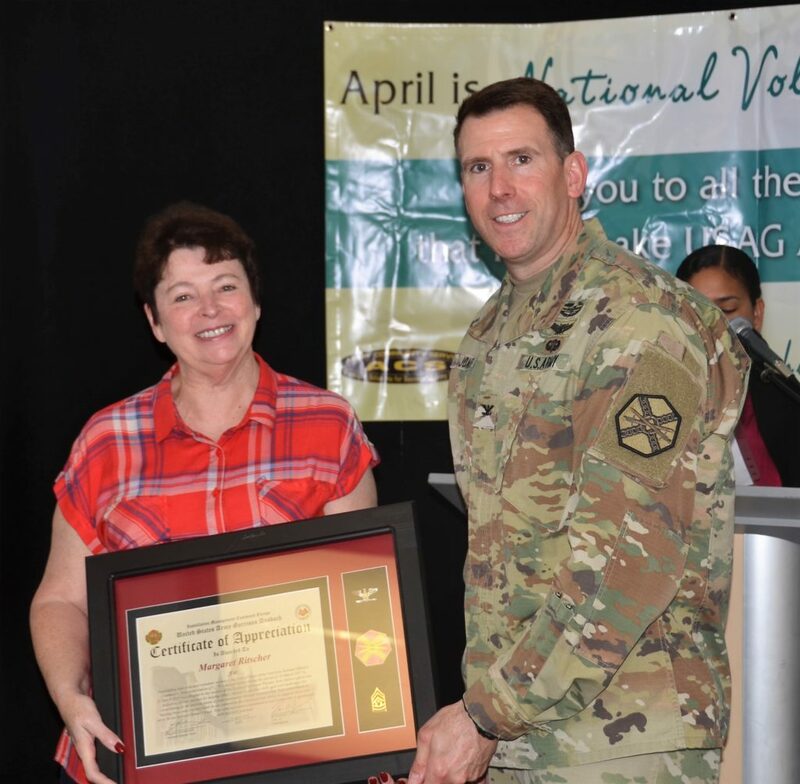 All honorees received a certificate of appreciation signed by the garrison commander, Col. Benjamin Jones, and the garrison command sergeant major, Command Sgt. Maj. Philson Tavernier, as well as a coin from the U.S. Army Volunteer Corps. To view more photos of the event, visit Volunteer Recognition Ceremony 2018 on FLICKR. Brian Sowders worked more than 1,400 hours for the entertainment department, which included assistance in concert and show productions, as well as all theater productions behind the scenes and on stage.